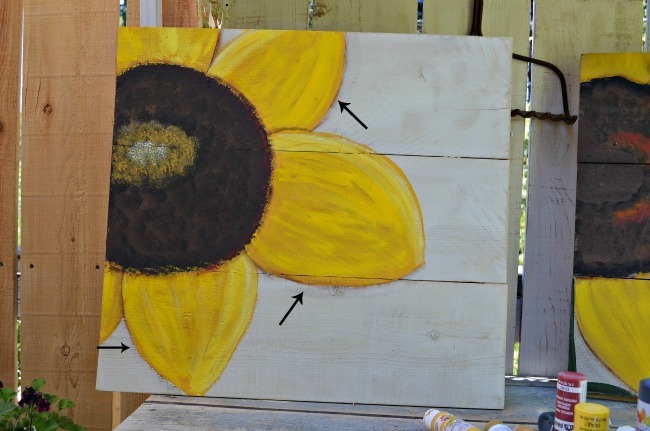 This is one of my favorite Fall projects and it is so easy for the beginning painter! The lettering is just added on via Picasa, it demonstrates what it can look like with wording or you can leave as just a painting. 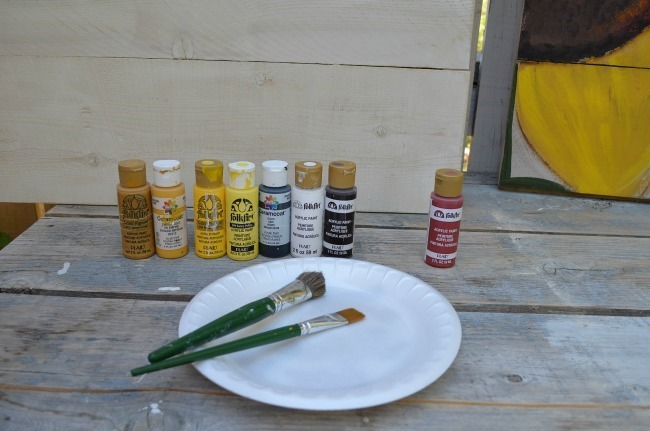 I earlier I wrote about my most used painting supplies and tools for easy reference. You get a good idea of what I have on hand for my art work. 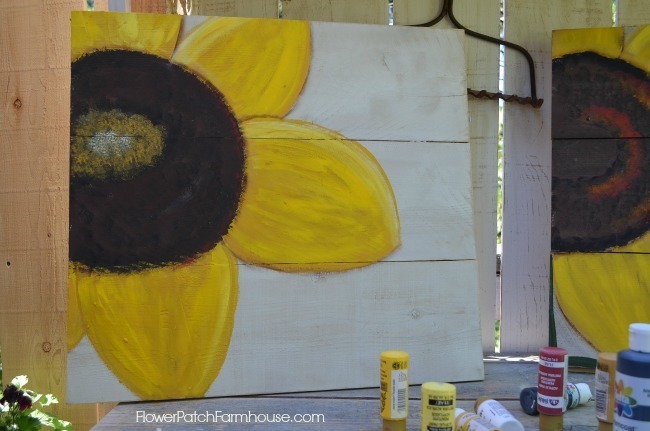 So are you ready to paint this easy to paint sunflower? 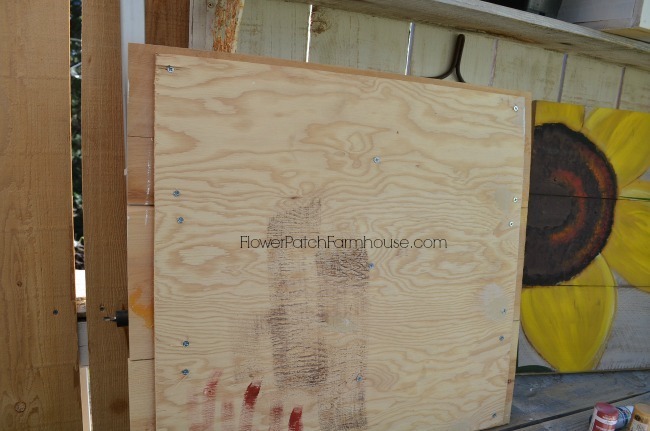 I have been painting on fence boards glued and screwed to a piece of 1/4 inch plywood. And I am using my Potting Bench as a Easel today. 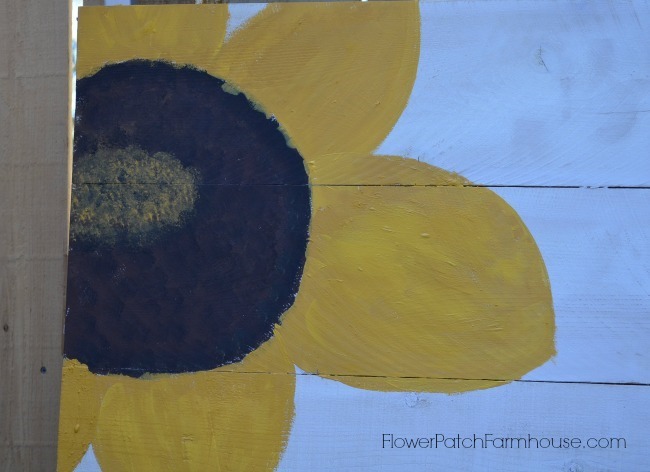 I base painted this one with Miss Mustard Seeds milk paint, Grainsack is the color. One coat is fine and then I sand it a bit to rough it up. 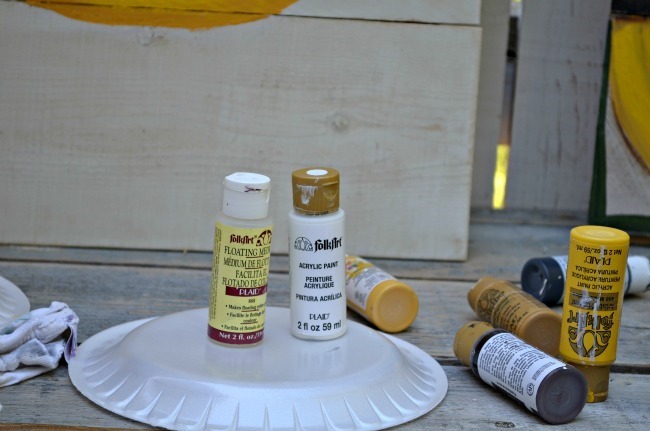 You can base paint with any paint you have, like the Folk Art craft paint. So here it is, ready for us to begin. 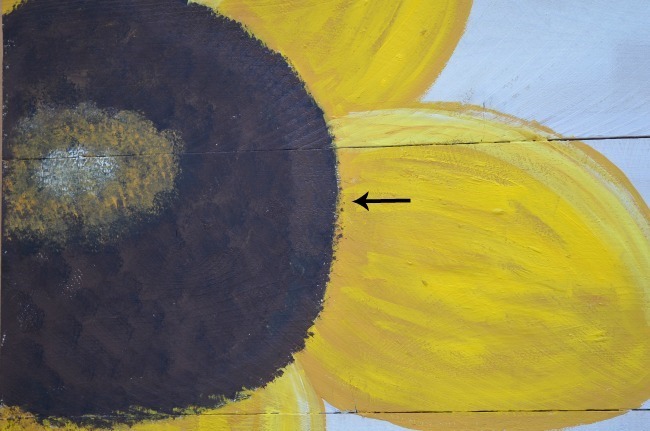 To the right is, of course, our first sunflower painting. and touch of Folkart Tomato red. I used a 3/4 in flat brush and a scruffy brush. These are the colors I used but if you have something comparable but in another brand that is good quality then that will work too. Sketch on your design lightly with a pencil. I know it is faint but you can see it if you squint with one eye and close the other. Load up your 3/4 inch brush (you can use a larger brush, this is just what I grabbed today) with Burnt Umber. I have a bit of Yellow Ochre here too in case I feel an area needs a touch. Just slap it on with no rhyme or reason, criss cross and fill in. Now to add some texture, double load the scruffy brush. It should look like it is half black half burnt umber. You will note I did put some Yellow Ochre in when I brushed in the Burnt Umber. and make a backward C shape around the very center. 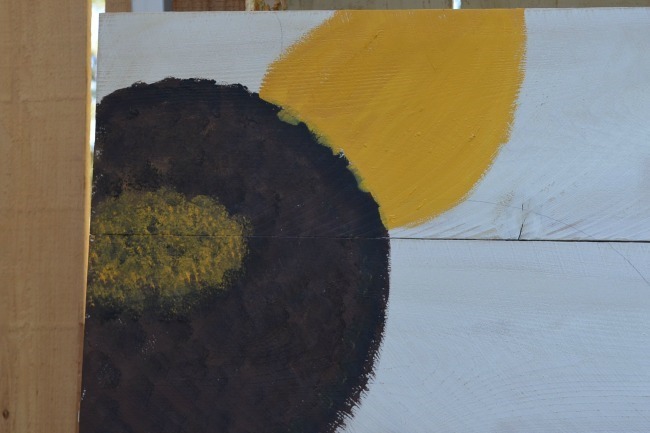 I put yellow ochre in the very center so it stood out to you. 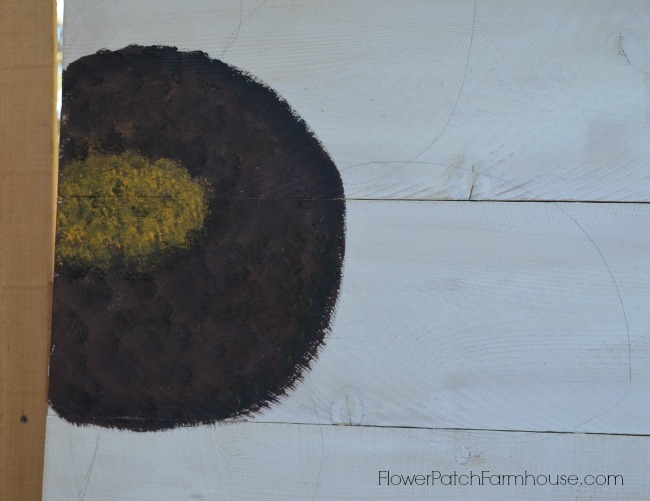 Now place a puddle of Yellow Ochre and another puddle of Empire Gold on your plate and double load your 3/4 brush. 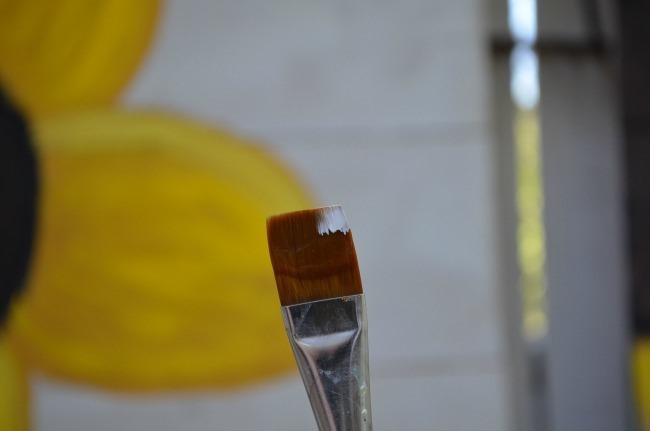 Double loading is where one side of your brush is loaded with one color and the other edge is loaded with the other. Fill in your petals, you will be able to see both colors streaking together as you do. Follow the shape of the petals. 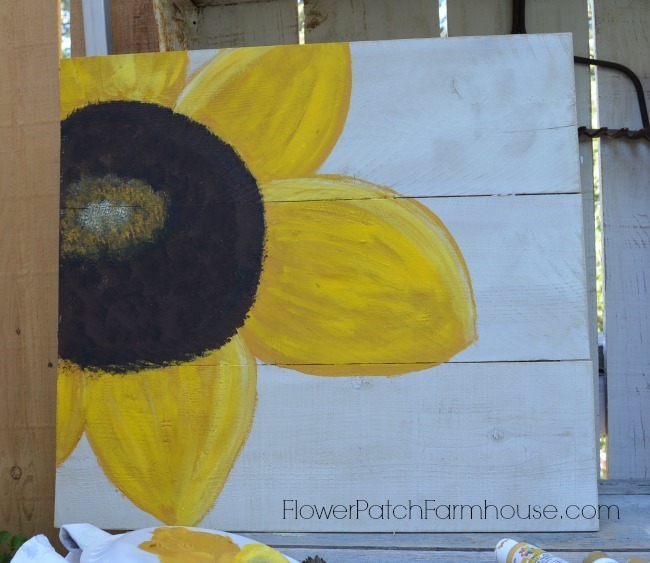 Here is all the petals painted with the Yellow Ochre and Empire Gold. Don’t worry about getting some on the center, that will be taken care of later. Now lets bring in some brightness. No need to let anything dry, just paint wet on wet, and if it dries on you, no worries, that works too. Clean out your brush by wiping it off with a cloth, no real need to wash it but if you want go ahead. Now load your 3/4 inch brush with Medium Yellow and brush it on, don’t fill it in, just streak it on following the lines of the petal. Again, don’t worry about getting any on the center. Now we will add a bit of highlights. Here is where you add the Sunny Yellow. But just on the one side of the petals. One item I failed to mention at the beginning. Floating Medium, this is clear and will help you to highlight and shade in some areas. We will use it with white to add even more highlights. 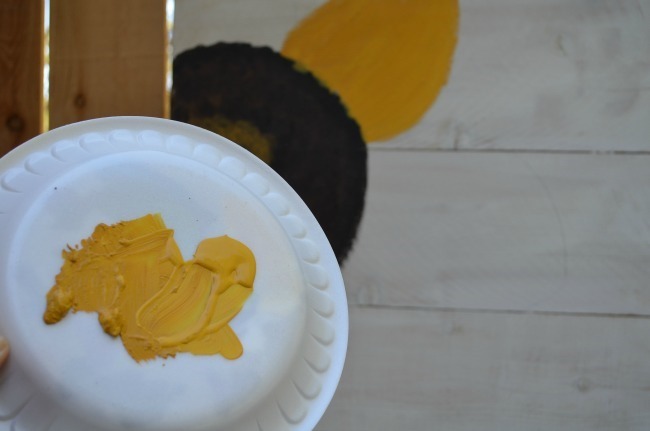 Load your brush with Medium then brush one corner thru a puddle of white and work it in a bit by brushing it back and forth on your palette. Now brush it over the Sunny Yellow streaks for added brightness. The effect is subtle but there. 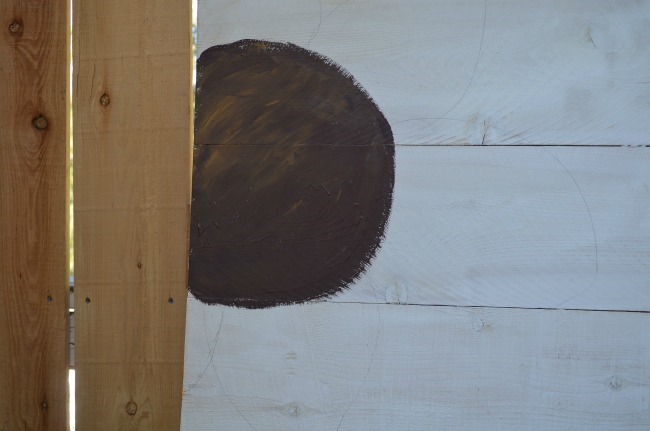 Now take that scruffy brush again, load it with Burnt Umber and pounce around the center to clean up the edges. But we need some shadowing. We should let it dry first so I will go do something else while it dries. 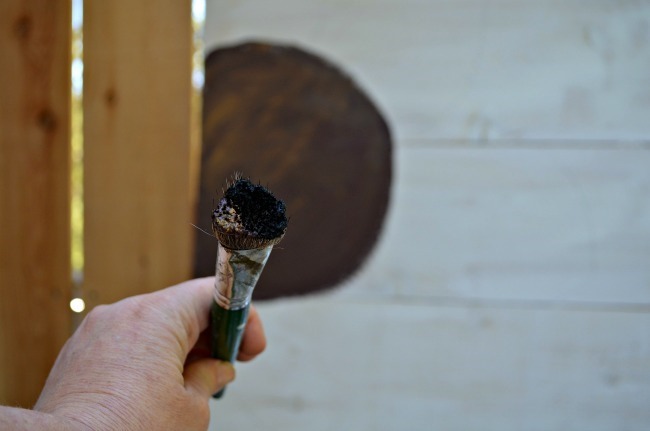 Load the 3/4 inch brush with the Floating Medium and brush one edge through the Burnt Umber, like you did with the White to highlight. Now run it along the edges of the petals, just the one side, where the arrows are pointing. Also where a petal goes over another, create a shadow there. I will put a coat of varathane on this once wording, if any, is decided upon. I use a water based exterior grade Spar Urethane by Varathane to preserve it and make outdoor display possible. I widened the bottom petal as it seemed out of proportion when I looked at the photo just above this one. I also had tapped just a touch of the Tomato Red along the right edge of the center. 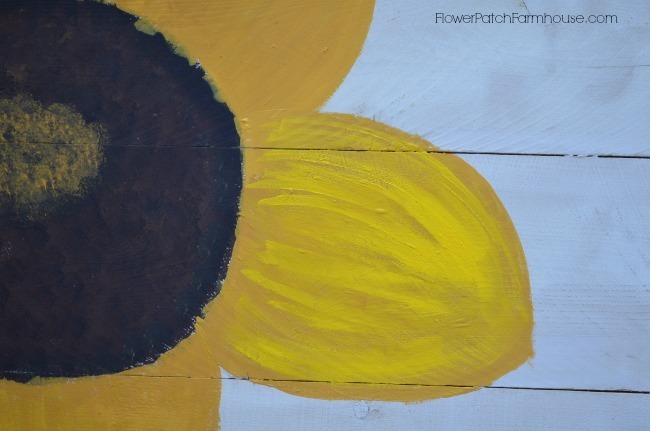 You can change the colors of the petals and center to whatever you like, there are so many color choices in sunflowers. I hope you get a chance to paint one. If you do please join our private painting Facebook page and share! More painting posts you will enjoy! 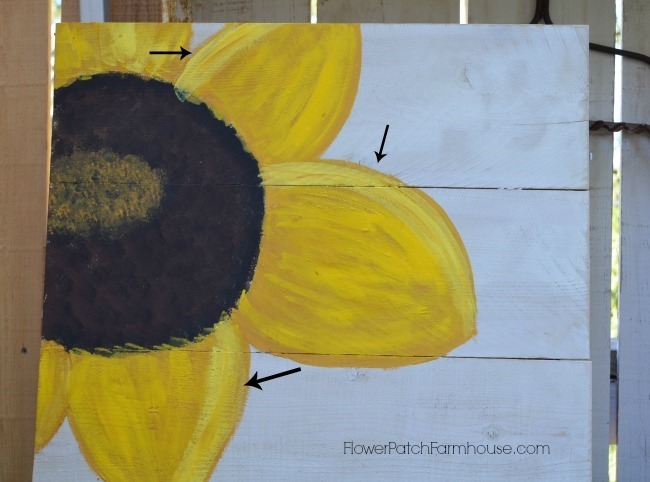 Harvest sign and how to paint lettering. Thank you so much for letting us know your painting technics. I’ll certainly be making one for my garden, if it’s a success maybe I’ll make some for Christmas gifts to give to my friends. I love it so much and you make it look so easy–but I over think it and it just never works out. I had a hard time with a paint by number for goodness sakes! I’m going to have to stick to painting furniture. I appreciate that there’s no talent needed for this craft! I love that you shared each step and it looks so easy! Would you mind to link this up to my Frugal Crafty Home Blog hop? I would love to see this painting in our collection this week! I know what you mean about finding the time. This Tutorial had been on my ‘to do’ list for over a month! I don’t post as often as I would like but I do try to keep things interesting. 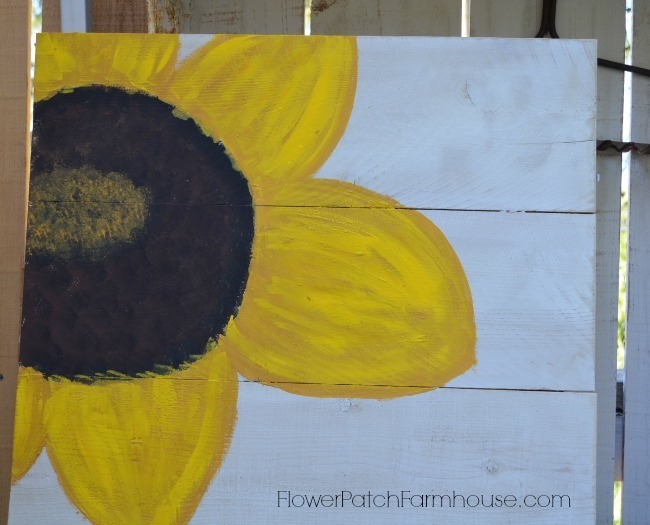 Your sunflower sign is just BEAUTIFUL!!!!! You did a great job with it, it looks lovely!! Thank you so much. It was a delight to paint. You are so talented! Thanks for the inspiration… I might actually give painting a try! It is worth a shot and you may be hooked. More tutorials to come. Thanks for stopping in and dropping a note! 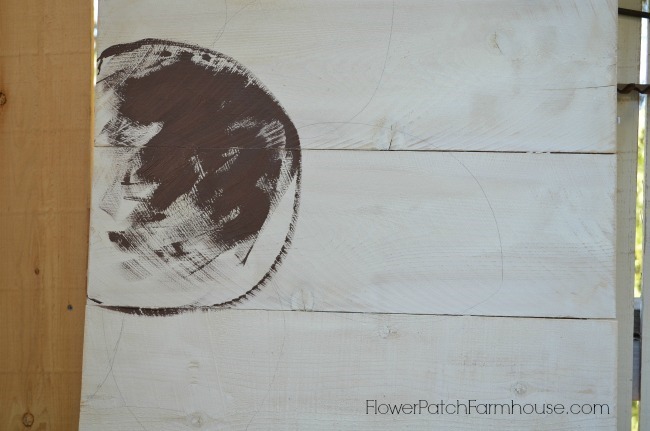 Thanks so much for linking this up to Frugal Crafty Home! Our next party starts on Sunday at 8PM Central time–I’d love to see you back! Thank you I will definitely try. Thanks for sharing this lovely tutorial Pamela. 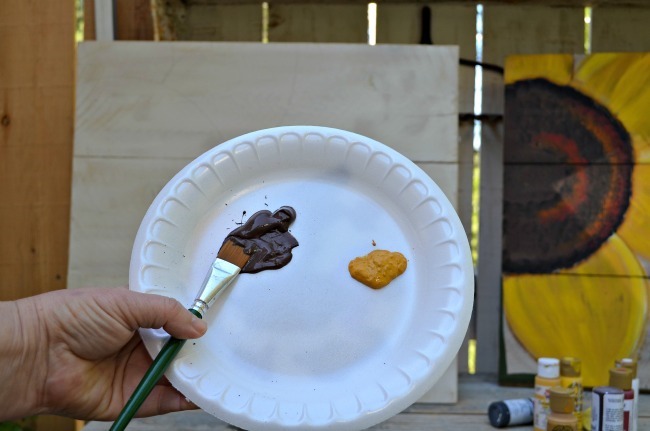 Love your website & love your painting & carpentry projects. 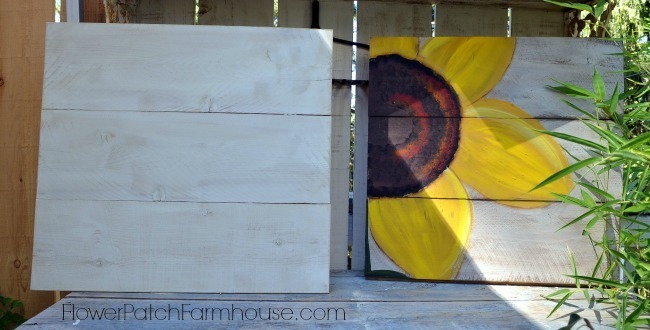 Just one question – what kind of wood are your fence boards- pine, cedar, oak? 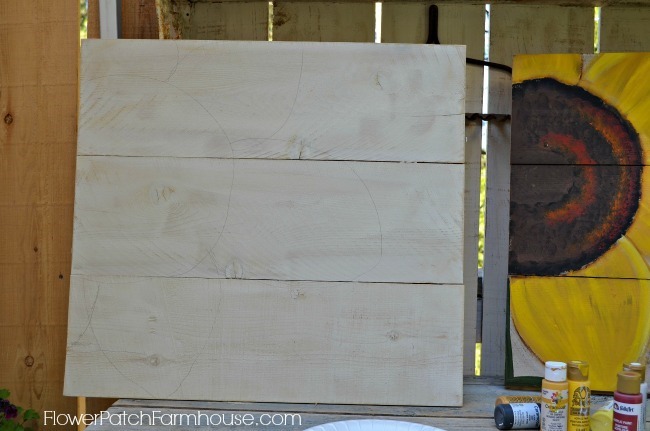 These are Cedar fence boards, they are about 7.5″ wide each. you make it look easy, thanks for the tutorial, pam! pinning:) happy weekend! Happy Weekend to you too, we are helping a friend move and it is a long way but we are having fun. 🙂 I should take a photo of the loaded trailer and post it on Instagram, I am trying to learn how to use that. Beautiful Pamela! !– you Almost make me think I can do this!! I really want to try!! I missed how you do the words though ?! Glad I refound your blog! Signed, not in a hurry for snow and cold!! I noticed that the sunflower in the first picture is different then the sunflower in the rest of your post. 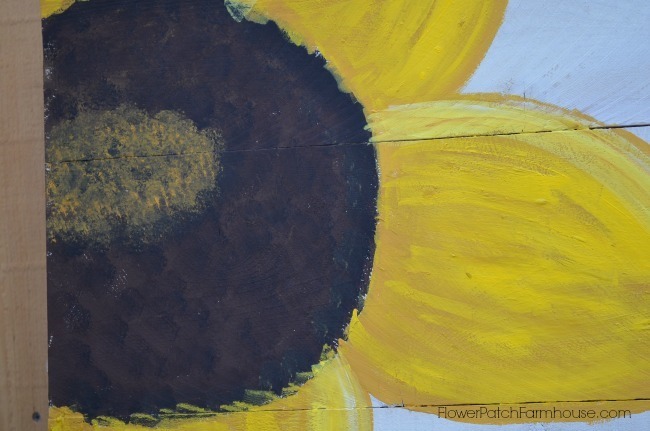 I just wanted to ask how you did the centre of the sunflower in the first picture and what colours you used? In the first one I just had tapped in a bit of the yellow and then the tomato red in the half circle for added color. I used the scruffy brush. I hope that helps. You are such a talent. I love all that you share. How wonderful to have a person who will share her painting talent with others.. You teach well. I am going to give this a try. Gorgeous. Pam, I was wondering if you have a tutorial on how to paint rosters? I have done a post but it was not a tutorial. I am working on one with both a hen and a rooster.